No festive meal is complete without the classic dish ‘garelu’ or ‘garellu’ in most Andhra homes, be it for Sankranti, Ugadi, Ganesh Chaturthi or Diwali. 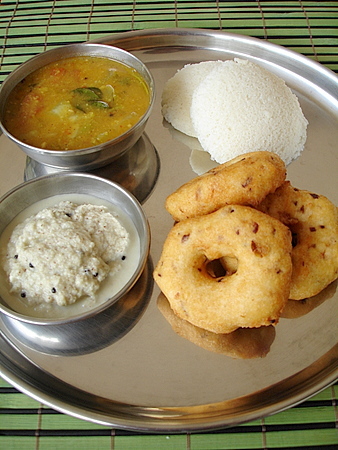 Infact during Sankranti,our major harvest festival, on Kanumu day, the sons-in-law of the family are treated to delectable delicacies and one savory dish prepared is garellu served with meat curry, sambar and coconut chutney. Soak whole black gram dal and 1 tbsp raw rice for 5-6 hours. Strain the water from the dal and grind to a paste sprinkling little water and salt. Don’t grind all the dal at once, use small portions to grind batch wise as its easier to grind into a soft paste. Add salt while grinding to a fluffy paste. 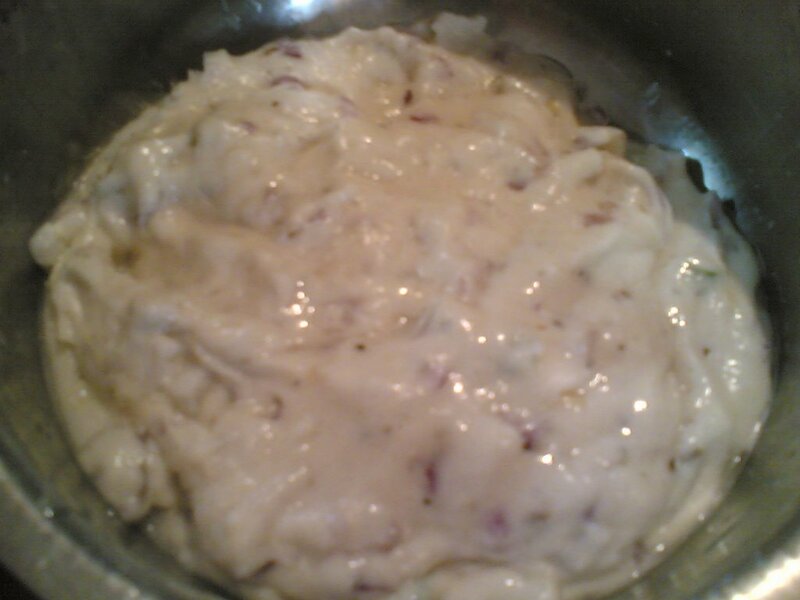 Then add chopped onions, finely chopped ginger and green chillies to the batter and mix well. Take a heavy bottomed vessel and add enough oil for deep frying. The oil should be hot. Wet your hands with water and take a lemon sized ball and flatten it into a vada on a greased sheet or banana leaf. Make a hole in the centre of the vada or gare so that it cooks evenly all over. Slowly drop it into the hot oil carefully and fry it on both sides on medium heat to a golden brown colour. Serve hot with chicken curry or mutton kurma, sambar or coriander chutney. Now head to your kitchens and make this ‘tiffin with a hole’ which is sure to give your tastes buds a delectable treat. Another variation is the addition of 1 tsp of pepper corns, few curry leaves and 1/4 tsp asafoetida to the ground gram dal batter, ginger and green chillis. Wow, I love south Indian tiffin items. I used to try going to Shantisagar every week when in Bangalore 🙂 You must cover everything! This one is sure to win over hearts of many foodies like me..sailu it looks delicious. Have been silent observer till now. Time to leavea comment now. Great Job and fantastic recipes. I am trying to cover most tiffins I prepare at home which I learnt from my ammamma,amma and a few friends. No one resist tiffin items,Lera. Thanks so much for dropping by,Shanti,and your kind words.Sure link to my blog and I have you linked to mine too,btw. Forgor asking you if it is OK to link u in my blog. I love medu vadai. I will try this one, I used to do it a little diffrent. Thanks for the recipe. Sailu, I start making vadas and end up making bondas 😉 I somehow, can’t seem to flatten it, leave alone make a hole in it. LOL. This is fascinating cuisine Sailu and you make it sound so simple and straighforward. I have ural dal but exhausted all of my rice stock. I’ll try to make the boys and their cousin who is visiting for a week to behave tomorrow at the Indian store where I’ll buy some plus other things to finally try few recipes of yours. I’m impressed at how healthy your treats are. I meant to tell you this before and this Ulli Garely recipe reminded me to do so. They look like the unhealthy and heavy doughnuts we have in North-America (sugar, white flour, artery clogging fats by the loads) but are the opposite health wise, featuring excellent food stuff as ingredients. This will make for a lengthy comment and I’m sorry about that but I *have* to tell you I read about the tradition of treating the sons in law of the family with delicacies in a book about the Rani of Jansi and her leading action against the British occupation in 1857. In that book by celebrated french author and historian Michel de GrÃ¨ce, I learned a lot about Indian traditions and day to day life (through the life of the Rani after she lost both her kingdom and her wealth to the British). I remember well the passage where this tradition you mention was described. Ok, enough said. I’ll make these for sure. I tired commenting on the uttapams but my system kept messing up and so I couldnt . Fran,its called Whole Black Gram Lentil and is available in most Indian grocery stores. Kay,its practice,practice and more practice..:).I used to make them like bondas initially but with practice I have been able to bring them to a doughnut shape. Zoubida,how nice to know that you share an interest with me in History..:)especially the Sepoy Mutiny of 1857.Rani Jhansi Bai is one of the most admired and valant woman warriors who fought for India’s freedom from British rule. Meenal,these vadas really dont absorb a lot of oil as most deep fried foods.You can overlook this aspect once in a while..:).I am glad you found the tiffins a visual treat. Nice’s vadas, looks soft and fluffy.Infact I was ready with a post for vadas, coincidence. will post it sometime. Keep up your work sailu. I loved your uppatapams, thought of making it for my little puppet. Your lil one will love them for sure,KM. Hey,Tin,you are one person who follows my blog regularly.It keeps me going and I appreciate it. Came here seeing your comment on my blog. All the photos on your flickr are yummy…and the muffins with chocolate coating are to die for !! I usually put a few black peppercorns and 1 tsp of cumin seeds when grinding the urad dhal. It not gives and aromatic flavour but the taste is intensified. Oh! I can never make vadas. Your vadas look perfect! I can never make it flattened like that. Have you got any tips to make it not so chewy. Was searching for Medu wada recpie over the net and bumped into ur site, my search for further recpies end here on ur site, u have taken gr8 efforts to put the traditional recipes on net, will love to try all these recpies. once again thanks to sailu. Hai Sailu, Hats off you and your recipes. You made my cooking very very easy, and also you encouraging me to try a lot of varieties. I feel that i’m on safe side while cooking because of your guidance. Thanks a lot!!!!!! HI Sailu! !Am a silent reader of ur site.great work! 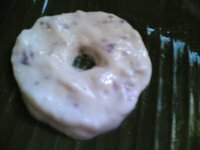 !Iam expecting my second kid n would like to eat bobbatlu n purnam buurelu.It will be kind of u if u can post the recipe. I end up with watery stuffing whenever i tried.thx. I have been reading and trying out your recipes for a while now and I must say that your food is simply delicious. The recipes are also easy to make and healthy which is great! I was just wondering, in this recipe when you say “1 1/2 cup”, what kind of measurement does that equate to so I know I wont get the quantities wrong. Do have a look at this post on measuring cups and spoons. The batter looks very soft, as per my knowledge, it should be little coarse, it tastes better that way, I just made them yesterday at my home for Ganesha chatudhi, they were delicious.